Safety switches with separate actuators are suitable for sliding, hinged and particularly removable safety guards, which need to be closed to ensure the necessary operational security. They are also suitable for fitting on profile sections and existing equipment. 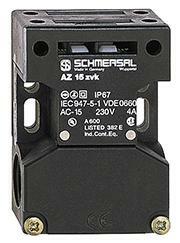 Control Components is an authorized distributor for the entire line of Euchner, Schmersal, ABB Jokab, and IDEC mechanical interlock safety switches.